Two-Pin LED Lamp conserves energy in commercial buildings. As plug-and-play replacement for 13 W CFLs commonly used in downlights and sconces, 5 W Helen Lamp GX23 helpsÂ conserve energy whileÂ delivering consistent illumination quality. Design, optimized forÂ compatibility and reliability, allows ballast to be bypassed, and lamp can operate directly off of 100–305 V, 50/60 Hz AC. Able to deliver 500+ lm,Â dry- and damp-certified lamp has 80+ CRI; comes in 2700K, 3000K, 3500K, and 4000K CCTs; and is rated at 50,000 hr to L70. Santa Clara, Calif. – Lunera® Lighting, Inc., a leader in lighting innovations accelerating the transformation to advanced LED technology announces the next generation plug and play replacement for compact fluorescent lamps (CFL), the Helen Lamp GX23. Commercial building owners and operators can save energy and reduce operating expenses by simply replacing the 13W CFL commonly used in downlights and sconces. Lunera’s five-watt Helen Lamp reduces lighting energy consumption by over 60 percent, while consistently delivering quality illumination. “We invented the plug-and play LED category with the Helen Lamp, which now has well over one million units installed. We’re excited to expand the family and launch the next generation Helen Lamp GX23 that continues Lunera’s tradition of bringing simple and cost effective LED solutions to the lighting market,” said Lunera’s Vice President of Sales and Marketing, Tom Quinn. The Helen Lamp GX23 has been enhanced to improve magnetic ballast compatibility and reliability. The lamp unlocks additional value for customers by offering line voltage support where the ballast can be bypassed and the lamp can operate directly off of 100V-305V 50/60Hz AC. Lunera’s design team used thermally conductive plastic instead of aluminum for the heat sink to reduce both the weight and the cost of the product, while maintaining long-term reliability. 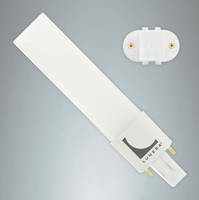 The two-pin lamp delivers over 500 lumens of usable light and has a Color Rendering Index (CRI) of over 80. It is dry and damp certified and can be used in open or fully enclosed fixtures. To create just the right ambiance for a variety of commercial lighting requirements, the Helen Lamp is available in four color temperature choices including: 2700K, 3000K, 3500K and 4000K. The long lifespan of the Helen Lamp GX23 is rated at 50,000 hours to L70, five times longer than comparable CFLs, offering additional maintenance savings. LED lamps do not contain mercury or other toxic materials, so recycling and disposal is simple. The Listed (UL1993) and Classified (UL1598-C) lamp is supported by a five-year warranty and is now available for purchase. Evaluation samples of the new Helen Lamp GX23 are available from Lunera’s authorized distributors. Contact Lunera to arrange a demonstration or to locate a local distributor. Lunera Lighting, an innovative technology leader, delivers LED solutions that are simple to install, reliable to operate, and valuable to own. Lunera designs, manufactures and markets high performance commercial LED plug-and-play lamps that obsolete traditional lighting technologies. For building owners and operators, Lunera’s products reduce operating expenses by lowering electricity and maintenance costs. For occupants, Lunera’s technology improves light quality, enhancing comfort and productivity. Based in Silicon Valley, Lunera is part of a community of progressive companies that challenges convention and transforms industries for the benefit of all. Visit Lunera.com for additional product and company information.